Designed to achieve success in the ritual The top capsule of Bios Urn was built to facilitate the growth of the seed. Before burying the urn you have to mix the components with some soil from where you want to plant the urn. The components allow a proper seed germination. 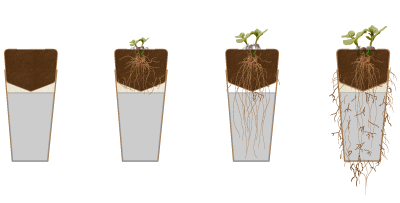 Form follows function Thanks to Bios Urn structure, the seed germinates in the top capsule, separated from the ashes. Once the urn starts to biodegrade seed roots are already strong enough to contact the ashes. With biodegradation the entire set becomes part of the sub-soil.